Long Steps is making progress, or I am with the build or somesuch. I’ve two planks to fit on the starboard side, leaving those two off while fitting the ‘offcentrecase” was a good trick, made it much easier to get in there and push it into place. I’ve done the pivot bearing cap on the waterballast tank side of the case, taped the case sides to the bottom panel and garboard plank, and done a whole lot of coating on the inside of the boat, three coats is whats recommended but gosh it takes a while to get done. Sigh, have to do it though, there are parts of this boat that are in places that will be impossible to get at later on. While I’ve been distracted with other things Phil McCowin and Howard Rice are putting a Long Steps together for Phil, Howard taking a break from the Voyage of Southern Cross project ( Here’s the link) https://www.voysc.com/ to help Phil out. That’s put the pressure on here, I’d not done much at the drawing board for a while, other things having to take precedence, so I’ve spent the last week working to stay ahead of them. The other two builders will be getting those drawings as soon as I’ve had feedback from Phil as to corrections and errors, and there are aways one or three. So I’m pushing on, have drawn out the case and ‘board, the mast boxes and the plank shapes. One of the things that will be evident to Howard and Phil, Howard having assisted with or built around 70 SCAMPs and Phil having built his own one, is that this boat is built like a battleship in comparison. When designing I work out the stress paths, hogging, wracking, rigging and such, and make an estimate of the forces involved. SCAMP is 11ft 11in, that’s near enough 3.60 metres in my own language, but this is 19ft, has twice the ballast of its smaller relative, and will be carrying a lot more sail plus will be moving much faster at times, all of which will about double the stresses that the structure has to cope with. My own planned voyage being one that will take me well out to sea, I prefer to have the boat slightly overbuilt rather than find out on a dark and stormy night that I should have used slightly thicker material or more glue. So she’s designed tough, light by the standards of most boats of her length but tough all the same. 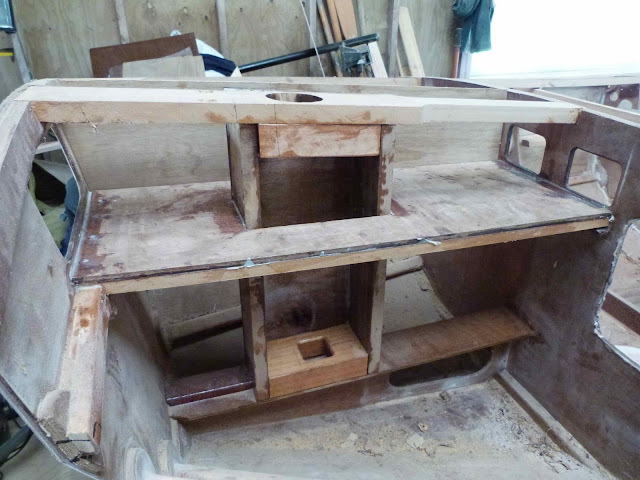 Howard and Phil are making famous progress with Phils boat, and Phil has been kind enough to send me some pics. This is toward the end of week one of the build, two guys working pretty much full time though, but its impressive all the same. I’m doing several hours each day trying to stay ahead with the drawings. Here's where they're at. Photos by Phil, don't you love the clean and tidy workshop! I still have distractions though, to help the monthly bills I do some specialised engineering work, on site maintenance and repair of woodworking machinery, it’s a field that I know my way around and enjoy, most of the people I see while working are very glad to see me as their machinery will be running not long after I roll in the door, but occasionally I come across some really funny things. Last Thursday I was called to a company with a heavy duty 200mm jointer, one with long tables and a heavy duty fence, probably 200 kg or so ( 440 lbs). They’d had a bearing issue, contacted an opposition company who sent a technician out, ( about $200 just for that) he’d told the client to get it to his workshop ( I do bearing replacement for those on the job, no big deal) which added to the cost, the job was done and the machine was returned, having to hire a fork truck to load on the way out and unload on the way back added to the bill. It vibrated, it shook so badly that it literally walked around the workshop! After seeing the bill, close to $1000 in total, the client was bitching at the company rep for the outfit that I contract to, and he said “phone John”. I was there a day later, listened to the complaints, fired it up and sure enough, it was unusable. Out came the stethoscope, listened to the bearings, they’re ok. The drive motor was ok, but there was a low frequency rumble in there that was much slower than the cutter rotation or the electric motor rotation. The only other moving parts in that machine are the drive belts and the low frequency noise was about what I'd expect from the time it took for the belts to rotate so off they came, all three from the triple groove pulleys. Bingo, they immediately took up a long oval shape, and all three had been on the pulleys in exactly the same place relative to the ends of the ovals. They'd most likely been cramped up tight in some form of packaging for a very long time and taken a "set", two flats and two sharp corners instead of a smooth circle. The belts were marked to show where the distortions were, went into a sink full of hot water for 20 minutes, were fitted with the marks evenly distributed and the machine fired up again. Smoooooth! The customer was super pleased, I’ve been asked to go back every few months to do a service run on all of his plant. I was super pleased, that was fun. Mind you, I don’t know what I’d have done if it hadn't worked. Tomorrow I’m off to town to learn how to post videos on YouTube ( thank you in anticipation Paul) , then go to Haddons house to help lift his brand new almost ready to launch Pathfinder out of the shed and onto his trailer. There are steps in the way which will make it interesting, but I’m hoping that we can combine the new knowledge of how to use the video camera, how to post on YouTube with the moving of the boat to provide you with some entertainment.